Throughout the entire history of the known world, men have conquered other men. Rulers have conquered cities. Emperors have conquered entire nations. At times, Kings have strived to conquer the entire world. But there remains one uncharted territory that has eluded men of power all throughout history. This unconquered territory is the human heart, and its sole conqueror is Christ the king. Today we celebrate together one of the great feasts of the Church calendar- the feast of Palm Sunday. Today we gather together to celebrate Christ’s entry into the city of Jerusalem. Today we celebrate Christ as the king who enters our own personal Jerusalem- our hearts. Today’s feast day is a momentary feast of joy and celebration, because tonight we begin the final leg of our journey towards Pascha. Our mood changes from one of joy this morning to one of solemnity, almost of sorrow this evening as we lead up to the great sacrifice that Christ performed for us on the cross. The feast of Palm Sunday has been celebrated in our Church since the earliest days of Christianity, but the use of Palms in connection with religious celebrations goes all the way back to Old Testament times. Oddly enough Palm trees did not grow around the city of Jerusalem, and people would often buy imported Palms for religious celebrations, in particular The Feast of Tabernacles celebrated at the temple in Jerusalem. The Palm branch was used as a visual tool proclaiming the sovereignty of God as the true king of the Israelites. With the expectation of the Messiah, and the events of Christ’s ministry on earth, word traveled quickly around Judea that Jesus was the one whom the prophets had spoken about and whom everyone was expecting. Yesterday Christ performed a miracle by raising Lazarus from the dead, the miracle that foreshadowed his glorious resurrection next Sunday. Now everyone is convinced that this is the Messiah-king who will save the Israelites. 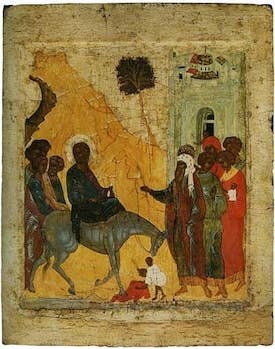 And Christ fulfills the prophecy of Zachariah, entering Jerusalem on a donkey. All of Israel is preparing to go to Jerusalem for the feast of the Passover, and Christ enters also as the salvific king who will save Israel not from the tyranny of the Roman Empire, but from the curse of death through His own death and resurrection. For Orthodox Christians around the world, we celebrate these events as they happened not only in the past, but as they also happen today. We celebrate Christ as the king who enters our hearts, our own personal Jerusalem. But is Christ able to enter? Is there room in our hearts for Christ to rule as king? Often the doors of our hearts are locked. Often Christ is unable to enter because there is already another king of the heart — ourselves. And how do we solve this problem of trying to let Christ in? How do we instill within ourselves the one thing that is missing- God? The answer is to surrender. Surrender to the will of God. Surrender your life to the one who gave you life. We are constantly bound and held captive by the temporal things of this life. We are prisoners of our own selves, of this world, of our careers, of money, of the politicians who rule over us, we are even slaves to our own passions. The only way to find peace, to find true happiness, to experience true love is to surrender yourself to God, to make Him your king, to live in total communion with Him. And the way in which we turn our hearts from the kingdom of the self into the kingdom of God is through constant daily prayer, reflection, and meditation, frequent Holy Communion, frequent Confession, reading and understanding the Scriptures. So many people complain that they can’t find time to come to Church, they can’t find time to pray and read the Scriptures, they can’t find time to fast, or go to Confession and Holy Communion. The reason they don’t have time is that they are slaves to their own selves, to their own will. If we don’t have time for God, then why on earth should God have any time for us? But God always has time for us. He is constantly knocking at the door to our hearts, to our lives and asking to come in. Some of the Church Fathers go so far as to liken God to a crazed lover who constantly seeks to be with the one that He loves- us, and who would do absolutely anything to be with the people that He loves. Today, as we receive our Palm branches at the end of the Divine Liturgy, let us take them to our homes and place them somewhere where we can always see them. Let the Palms remind us that Christ is the king of our families, that Christ is the king of our hearts, that Christ is the only true answer to happiness and meaning in our lives. And if we do proclaim Christ as our king, let us try and make time for Him in our daily life, let us be reminded that He is the one with whom we will be spending eternity. Let us be reminded that our careers, our education, our finances, our homes, all of the basic material needs in our lives are only temporary. Let us prioritize and place Christ the king as the primary concern in our lives. It is only when we have done this that we will find true peace and happiness in such a confused and complex world. Amen. SERVICE SCHEDULE All services are held at the Cathedral unless otherwise noted. Please watch the Messenger and website for places/times of other services. NOTE: Elevators available at both the Cathedral and the Parish Center.